There was once a Backbone School in the area. The cemetery dates back to about January 18, 1887, with the last grave in 1930. This is a very isolated cemetery located on a dirt road that runs behind fields. Lake Lavon is just beyond the cemetery on the east. The cemetery may be on US Government property. In a deed in Vol 721, p 360, the Princeton Independent School District is compensated by the US Government for losing the Backbone School to Lake Lavon. The cemetery is also mentioned in the deed. At the time of my visit the grass had been freshly cut. The stones were all standing. 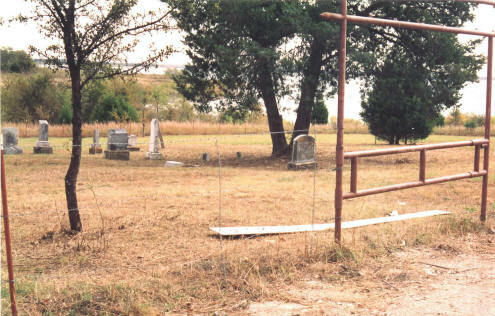 The cemetery is fenced with a wire fence. There is a gap on the right side of the driveway gate for entry. The sign that goes over the gate was on the ground. There are several marble markers engraved Unknown 4, Unknown 5, Unknown 8. etc. It is said that the cemetery was used to bury people who died and no one knew their names. There are said to be over 100 unknowns buried here. Because of its isolation, this cemetery suffers a lot of vandalism.